New River is a community located in Maricopa County, Arizona. It has a population of 14,952 residents and rests on 70.8 square miles of land. New River was founded by Lord Darrell Duppa in 1868 as a stagecoach stop. For many years afterwards it was the terminus for the old Black Canyon Highway. It’s now a thriving family friendly community full of residential and commercial areas. Residents enjoy shopping, dining, entertainment, and outdoor recreation. There are many beautiful homes in the area for residents to choose from, including single family homes, town homes, apartments, and condominiums. The median home value is $300,900. The home value rate has risen by 0.6% in the past year and it’s predicted to rise by another 3.8% in the coming year. 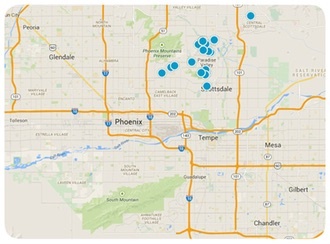 The median price per square foot is $142 and this is higher than Phoenix Metro’s median of $124. If you are interested in purchasing a home in New River, contact us today for more information.